Occasionally you might have come across technical problems with your computer like a slow network connection or problem in audio. If you are not a tech-savvy you might have tried finding a solution to them online. System32 is one of the important Windows folders on your computer which is located in either C:\Windows\System32 or C:\Winnt\system32. The System32 directory contains Windows system files and software program files, essential for the operation of the Windows operating system and software programs running in Windows. It is present in versions of Windows from Windows 2000 and onwards. Is it safe to delete the System32 folder? Ideally, it is not safe to delete System32 as is it essential for the programs running under Windows. Thus, the System32. files are protected by the TrustedInstaller so that the files are not deleted accidentally or unintentionally. Moreover, deleting System32 leads to the breakdown of Windows installation and will need a fresh version of Windows. Thus, it is advised to be deleted only when you are in the process of removing a problematic Windows installation. For this reason, it is essential to know how to delete System 32 Folder in Windows precisely to avoid unnecessary errors. As previously mentioned, System32 is protected to prevent users from removing or modifying the content present in that folder. Thus, before deleting System32, it is necessary that you are aware of what are you deleting and we are not responsible for any damage caused. This information is provided only solely for educational purpose. Hence, there are few methods using which you will help you to know how to delete System 32 Folder in Windows. Open the notepad and type cd in it. Find the file you want to delete, right click on the file and open Properties. Now click enter and on the next line type del. Save this file with name .bat extension and Save as type as ‘All Files’. Thus, save this file and by double-clicking on it, you can delete the System32 folder. This method is commonly known as Batch File. This method needs you to have administrative permissions. Click Start and search command open Command Prompt. For taking ownership of System32 folder type takeown /f C:\Windows\System32 in the command prompt and click on Enter. In order to delete System32 folder type cacls C:\Windows\System32 and click on Enter. Close the Command Prompt as well as any other running programs. Then open the C:\ drive under Computer folder. Find the System32 folder and delete the files or the entire folder. Also, you delete the files by typing the path in takedown and cacls which get to the file location. Open the System32 and right click to open the Properties. Then click on Security and then Advanced. You will find the Owner tab and you will see Trusted Installer as the Owner. Edit the Owner by changing it to your account or Administrator account. Additionally, mark on the Replace owner on subcontainers and objects if you want to delete more than one files from the folder. Close all the Windows and then again open the System32 and go to the Properties. Now go to Security, then Advanced and then Edit. Tick the box next to Full Control and click OK to continue. 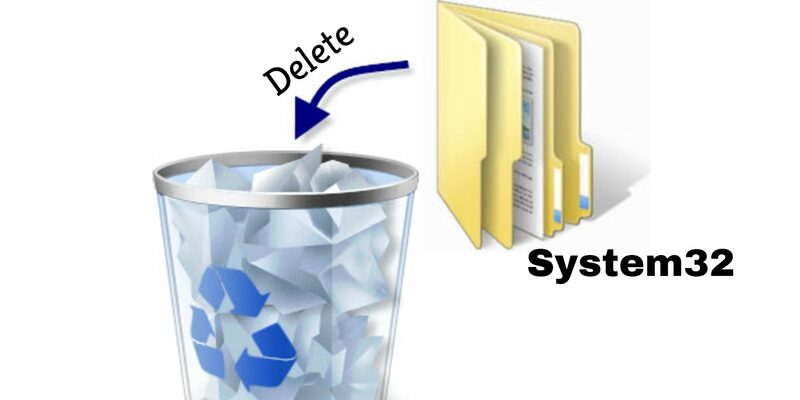 You can easily delete the System32 folder without any security messages. These methods are commonly used and advised on how to delete System 32 Folder in Windows. Similarly, the answer to the questions like how to delete System 32 Folder in Windows 10 will be the same i.e. same methods can be used. If in case any of the files from the System32 folder are damaged or corrupt, there will be an error while you start your computer. You can resolve the System32 related issues conveniently from Windows 7 and onwards including the Start Repair option. Hit the F8 key while you’re starting the computer. Then select Startup Repair from the list, and click Next. Thus, your computer will scan for the problem involving the System32 folder, find the damaged or missing system files, and replace them with backup copies. Once this is done, your computer will boot into your Windows desktop. Does deleting even one file from the System32 folder can affect the computer? Ans:- Yes, deleting even a single file from the folder can be invasive is just equals to murdering your computer. How to remove System32 virus? Ans:- Update your antivirus program periodically. Thus, it will prevent any virus attacks from the computer. What is ‘Delete System32’ prank? Ans:- There’s a hoax going on around the Internet for a long time, where inexperienced users are tricked into deleting their System32 folder. These pranks mainly include instructions which cause a user to engage a system command or bypass procedure that trick the safety measures present in your OS. Always remember any advice regarding delete System32 from your computer is wrong advice meant to trick you into sabotaging your computer and not fruitful for your computer. If you have some more tips and trick for how to delete System 32 Folder in Windows, feel free to comment below.